Please read some of the comments made by our customers, you are welcome to leave any feedback, that will improve our service. Our friendly team is here to help you as your local specialists in home improvements for over 25 years. I needed new windows for my mother’s house in Netherton, and I got a few companies to come and give me an estimate. SGK came, listened to what I wanted and then made suggestions on how to do that with the best quality/price ratio. The other firms came, didn’t listen to what I wanted, and then made suggestions about the products they wanted to sell me. 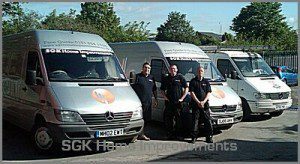 The SGK people came on time, on the day we’d agreed and did a great job with our windows and doors. They were quick, efficient and conscientious and tidied up after they’d finished – which, as my father used to say, is the sign of good workers. I am happy to recommend SGK here just as I have already recommended them to friends and family in Liverpool. Extremely happy with job carried out, from foundations upwards the job was managed in a professional manner and to a high standard. The outside was set off very well with black seamless aluminium guttering running around the whole property (that doesn’t sag like the plastic guttering you can buy) and with cleverly hidden support brackets that shows a clean line. Windows and doors all well sealed. This was not the first job carried out by SGK and if I needed anything else doing to the house I would certainly call them first. We have recently had a porch fitted and would like to say how pleased we are with the workmanship and the attention received from the fitters from the lads who dug out the foundations and did the brickwork the ones who erected the porch and the tiler all were great to deal with and did a great job. We would be happy to recommend SGK to any body. I was most impressed with the choice of door panels, the speed and quality of the fitting, the price and the reliability of the company. Steve at SGK has carried out a number of jobs for me over the past 18 months and I can not praise him and his team highly enough! I would recommend his work to any of my friends and neighbours. I would recommend SGK Windows to anyone who is looking for a professionally finished job. I was very impressed with the service right from quotation through to completion. Thanks for a great job. Good price, good workmanship and a pleasing overall result. We are very happy with our new porch, which really enhances the frontage of our house. We would certainly recommended SGK Windows. SGK did what they said they would when they said they would. No disappointments at all. Great help with design. Excellent quality and workmanship. The conservatory became and remains my favourite room in the house. The extension and garage conversion was a major piece of work for us, and even involved a kitchen move. What was reassuring was that at each step of the build the respective SGK specialist kept us informed on progress, kept the work area as clean as possible, and delivered a quality job. We were very happy with the final outcome. Our structural engineer told us “if the house was ever hit by a Tornado at least the extension would still be standing”… obviously a bit of humour but testimony itself to the guys from SGK – Thank you. SGK arrived when they arranged to no dramas, fitted the door efficiently, fitters were polite and chatty. The fitters tidied up after themselves. Door is great and I have had no problems at all. I highly recommend this company; they do as they say the will, fit efficient double glazing units.